Because our little boy gets bored easily, we always make it a point to bring a few of his toys whenever we visit our doctors for check-ups or leave the house to go somewhere else. 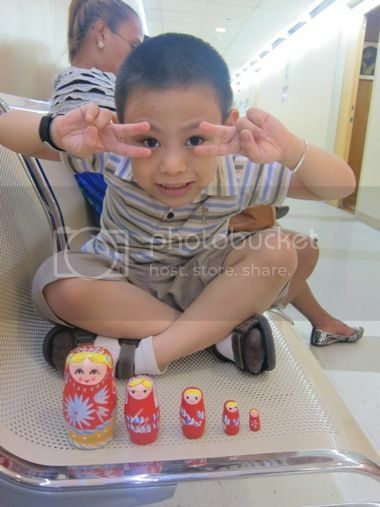 Last May when we went to consult his pediatrician, he got preoccupied playing with the wooden Russian dolls that we bought from the gift shop at the hospital lobby earlier that day for Php200.00. His interest in these Russian dolls might have been sparked by the kiddie television show Higglytown Heroes. His fascination with these nesting dolls only lasted for a few days, however, as he has lots of other toys to play with. These Russian dolls are now neatly placed on our TV shelf for display. Because these dolls are so cute, I also plan to buy Russian doll cushions soon. This entry was posted in Atryoshka Dolls, Babushka Dolls, Higglytown Heroes, Nesting Dolls, Russian Dolls. Bookmark the permalink. ← Good Job Stamps for My Little Boy!